This terrific gargoyle was on a building somewhere in the vicinity of Rittenhouse Square. These textures are on the Church of the Holy Trinity, on Rittenhouse Square. Built around 1859, it’s a well known Romanesque Revival wonder, with the most amazing stained glass windows inside. Some historical data I found online says the exterior is “Brownstone ashlar” and “Coarse sand mortar patchwork is visible in some areas, punched and gouged for textural effect.” I love that – punched & gouged for textural effect. Just don’t do it to me. Incidentally, “Oh Little Town of Bethlehem” was written by the church’s second rector, the music by its organist. 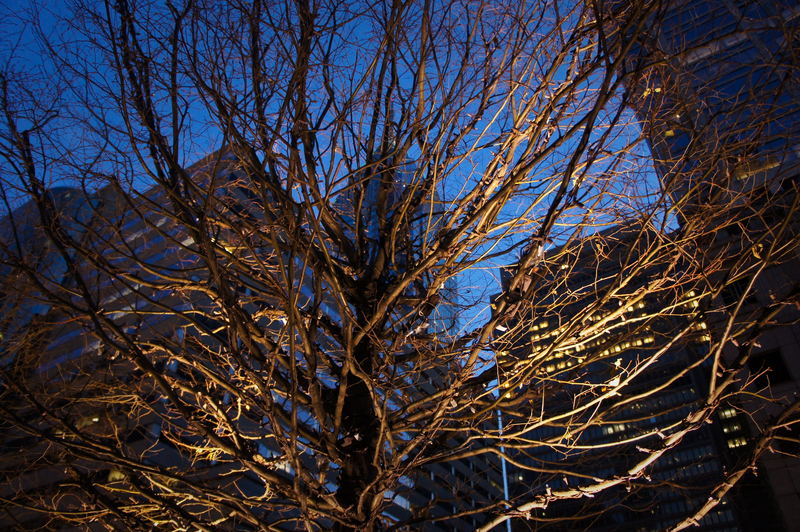 Finally, looking up at dusk towards Philly’s skyline, the light shining on nearby tree branches seems to make a scrim through which the slick dark rectangles of modern buildings shine dimly. 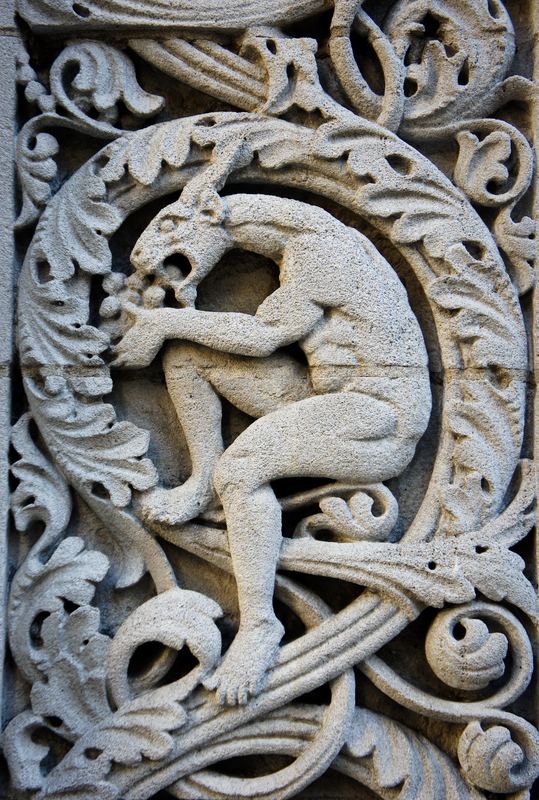 This entry was posted in photography and tagged architecture, gargoyle, Philadelphia, Rittenhouse Square, texture. Bookmark the permalink. Don’t you just love churches? I do. I try to stick my nose into practically every church that looks interesting. A couple years ago I decided to see what medieval stain glass was left in my ten miles in Oxfordshire and I found only one church. Only one out of…like…millions. Those Victorians have a lot to answer for. 🙂 Oh, I love this white font on the gray. They certainly do come in an incredible variety of shapes & sizes here in the states. Guess you have to try for 100 miles!